The man who invented the automated cash machine is one of four engineers to be added to the Scottish Engineering Hall of Fame. James Goodfellow is being given the accolade along with telephone inventor Alexander Graham Bell, lighthouse designer Robert Stevenson and structural engineer Sir Duncan Michael. The hall of fame was launched in 2011 by The Institution of Engineers and Shipbuilders in Scotland. It now has 27 members. Gordon Masterton, chairman of judges for the hall of fame, said: "We are delighted to welcome more recent engineers like Duncan and James into this pantheon of Scottish engineering, as well as some of the notable older pioneering engineers. "Scotland can rightly claim to have provided the educational base for many of the world's greatest engineers who have gone on to lead great companies and make world-changing inventions. Duncan Michael and James Goodfellow are living proof that this tradition is alive and well." Collectively, the 27 members in the hall of fame tell a story of 450 years of world-beating engineering innovation that has led to massive improvements in the quality of life and economy in Scotland, the UK and worldwide. Welcoming the announcement of the new inductees, Sara Thiam, director for the Institution of Civil Engineers in Scotland, said: "It is wonderful to see great engineering getting recognition. "Many don't realise the human impact that civil engineers, and engineers in general, make upon everyday life. But the induction of someone like James Goodfellow highlights an innovator of a piece of engineering most of us use every day in life without thinking. "Civil Engineers, and other engineers, create the environment we live in, so they have a massive impact on all our lives. The hall of fame attempts to recognise that contribution." 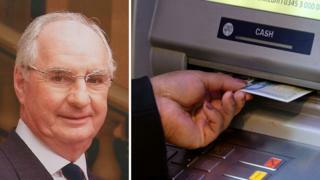 James Goodfellow, who was born in Paisley in 1937, received just a £10 bonus for his invention and patent of automated cash machines that used pin numbers. "My task was to design the means of allowing a customer, and only a genuine customer, to actuate the dispenser mechanism," he said. "Eventually I designed a system which accepted a machine readable encrypted card, to which I added a numerical keypad into which an obscurely related Personal Identification Number had to be entered manually, by the customer. "This pin was known only to the person to whom the card was issued. If card and keypad inputs agreed, the cash dispenser mechanism was activated and the appropriate money was fed out to the customer." Automated telling machines (ATMs) spread throughout the world and there are now an estimated three million machines. Mr Goodfellow continued to generate innovative design ideas and leadership throughout his career and was twice a recipient of IBM's Outstanding Technical Achievement Award. Sir Duncan Michael, who was born in Beauly in 1937, reached the highest level in global consulting engineering through his excellence in structural engineering and business expertise, and restructured Ove Arup and Partners into a global business. In 1957 Arup had joined with Jorn Utzon to design the Sydney Opera House which was to be a highly complex construction. Sir Duncan's part of the project was the "side shells"' which supported all the spherical roof surfaces as key elements of the project. He was knighted in 2001. Alexander Graham Bell was born in Edinburgh in 1847 and emigrated with his family to Canada in 1870. The following year he moved to Boston and became interested in transmitting the human voice over wires. In 1875 came up with a simple receiver that could turn electricity into sound and was granted a patent. The Bell Telephone Company was created in 1877 and by 1886 more than 150,000 people in the US owned telephones. In January 1915 Bell was invited to make the first transcontinental phone call from New York to San Francisco. When he died on 2 August 1922, at the end of his funeral the entire telephone system in North America was shut down for one minute in tribute to his life. In 1888, Bell was one of the founding members of the National Geographical Society and has been ranked as among the 100 Greatest Britons. Robert Stevenson was born in Glasgow in 1772 and was the father of David, Alan and Thomas Stevenson who all became engineers. His grandson was the famous author, Robert Louis Stevenson. His first assignment as an apprentice was the supervision of the erection of a lighthouse on Little Cumbrae. From these beginnings he realised the importance of lighthouses and that the marking of navigation hazards would save countless lives and greatly improve the safety of near coastal shipping. In total, Robert Stevenson was responsible for building more than 15 lighthouses, including the Bell Rock Lighthouse at Arbroath in 1811. Stevenson was also responsible for a number of bridges in Scotland including the Stirling New Bridge, Annan Bridge, and Hutcheson's Bridge over the Clyde in Glasgow.